Production issues postponed Travis Scott&apos;s Milwaukee performance to the tour&apos;s second leg, but it was well worth the wait. 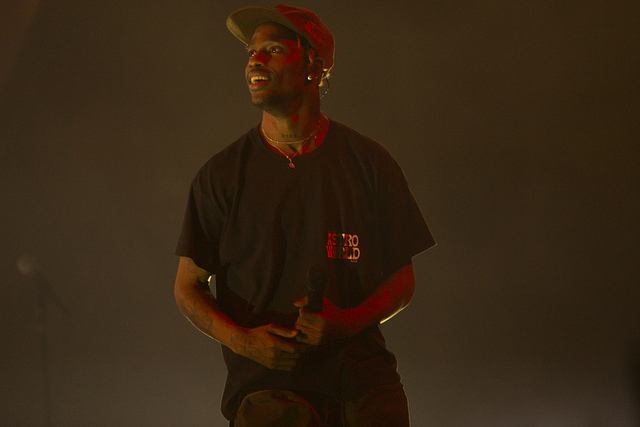 Published Feb. 23, 2019 at 10:01 a.m.
"Anything can happen at the night show," even Milwaukee's first major arena concert by a rapper in over a decade, and that's just what went down last night as Travis Scott brought his critically acclaimed "Astroworld: Wish You Were Here" tour to Fiserv Forum. Originally scheduled for last December, the "Sicko Mode" rapper delivered as promised and brought the second leg of his tour to Milwaukee for Fiserv Forum's first rap performance. Organizers couldn't have picked a better show either, as Friday night's sold-out show was far from tame and one that the city will be talking about for quite some time. 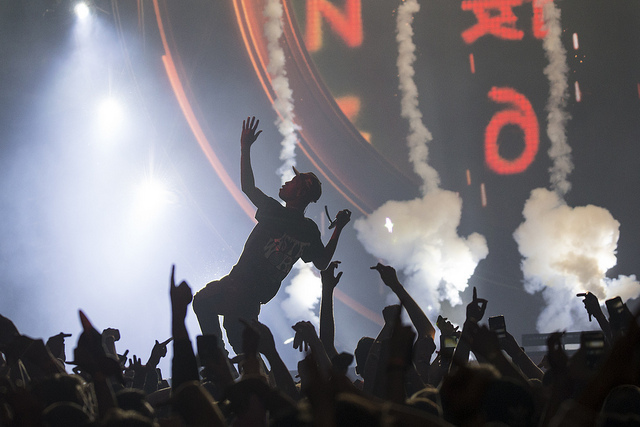 From start to finish, the brand new arena's foundation was tested while fans on the general admission floor moshed throughout the 90-minute show. If Travis Scott's multiple dates at The Eagles Ballroom gave you "Goosebumps" on his last tour, then last night was beyond imaginable. Here are eight reasons you shouldn't have missed Travis Scott's 'night show' at Fiserv Forum. Milwaukee isn't necessarily a hub for mainstream hip-hop, but the city's biggest rap fans have certainly enjoyed a number of memorable concerts throughout the years. From Kanye West and Kid Cudi's epic Summerfest performance to the countless number of rap shows at The Rave, Milwaukee has embraced the genre. Unfortunately, the Bradley Center was late to the party and rarely hosted rap performances. In fact, a major Milwaukee arena hadn't hosted a rap concert in over a decade – but that all changed on Friday night. With his history of great Milwaukee performances and entertaining live sets, Travis Scott was the perfect artist to change the trend. Let's hope that last night's show was just one of many rap concerts that Fiserv Forum will host in the coming years. If the building can survive a Travis Scott show, it can survive anything. Travis Scott picked a theme and completely ran with it for his new tour. Dubbed the Astroworld Tour, inspired by Houston's Six Flags Astroworld, which closed in 2005, the G.O.O.D Music rapper transformed the entire Fiserv Forum into an amusement park. With amusement park decorations and even arena employees wearing carnival inspired uniforms, Travis Scott went all out. The Astroworld culture has even took on such a life that Houston's mayor is looking to ride the wave by building a new amusement park in Scott's hometown. Admittedly, I was uncertain if last night would actually happen. After the originally scheduled Dec. 8 date was postponed due to production issues, without a replacement date immediately announced, the cynical side of me wondered if the postponement would later turn into a cancellation. Lucky for Milwaukee, with the announcement of a second leg of Travis Scott's tour, a new Fiserv Forum stop was added to the calendar. Although fans were only forced to wait another three months, last night was definitely worth the wait and fans already can't wait to welcome La Flame back to Milwaukee. Travis Scott fans are an entirely different breed of music fans. While many rappers, bands and artists may like to claim that their fan base is the wildest, Scott's take the cake – and it isn't close. If you were brave enough to enjoy last night's performance on the general admission floor, you were likely swallowed up in a number of mosh pits while fans raged throughout the set. Scott served as the ring leader for his circus of fans by matching their energy levels as he screamed his lyrics on stage while sprinting from stage left to stage right, even inviting fans on stage to dive into the crowd while the arena's security stayed busy and nervous. Friday's performance had several ups and downs, but only in a literal sense. The ups and downs came via two actual roller coasters that Scott's crew builds for each city. The first roller coaster ride took place on the floor's B-stage, early in the set. After opening the night with a psychedelic video commercial for his fictitious Astroworld and performing his track "Stargazing," Travis Scott strapped himself into a 360 roller coaster loop. One coaster isn't enough apparently, because during his hit track "Antidote," Travis Scott hopped on a different roller coaster that descended from the rafters and took the rapper and a lucky fan between the main stage and the B-stage. It was no Great America, but Travis Scott definitely took his fans for a ride last night. Travis Scott built a strong following through his wild and energetic performances when it was nothing but him, his DJ Chase B and a microphone. Now he is making sure those fans multiply and continue to come back tour-to-tour with his elaborate production. After riding a giant bird during his last tour, Scott one-upped himself for his first headlining arena tour. Not only did last night's performance have roller coasters and amusement park inspired activities, but there was no shortage of fireworks, lasers, smoke cannons and fire throughout the set. One standout moment came near the end of the night as a huge oval and transparent drape filled the entire arena floor as neon images were projected into the sky. For Scott's track "Yosemite," a giant inflatable astronaut raised 50 feet above ground level to supplement his performance. Often artists skip on production to save costs and simply because they don't need it. And while Travis Scott certainly doesn't need his elaborate production, he spared no expense when creating a memorable concert for his fans. Before Travis Scott blessed the stage, his Cactus Jack Records signee Sheck Wes got things started. Sheck Wes, known best for his breakout single "Mo Mamba," is no stranger to Milwaukee. While he claims New York as his home, Wes lived in Milwaukee for nine years before moving to the Big Apple when he was 14. The crowd welcomed him like he never left. There was no better ending to the crazy night than with Travis Scott's mega-hit single, the Drake-assisted "Sicko Mode." No rap song is bigger than "Sicko Mode" this year, so as expected, the crowd went crazy when the track dropped. With pyrotechnics engaged and confetti falling from the sky, the crowd raged with Scott as he said farewell to end the set. After thousands of lost voices and zero casualties (despite the wild performance), Fiserv Forum may be your new favorite place to see some of the biggest names in rap in the near future.